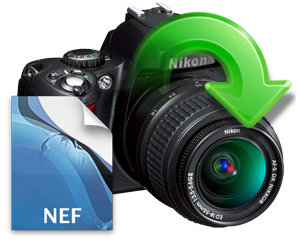 NEF is the abbreviation of Nikon Electronic Format. It is a RAW file format, used in Nikon cameras to save photos. RAW images are noting but digital negatives which cannot be directly used as images, but contains the information needed to create an image. NEF files have more ample quality so the image stored in NEF format will have high resolution. This file either use loss less compression technique or the file is not at all compressed. The captured NEF images can be saved as a TIFF, JPEG or again as a NEF format. As long as your original NEF file is preserved, the digital negative remains unaltered. Processing a NEF file does not alter the original instruction set. Though Nikon is providing many features to protect your images. Sometimes, the files may get deleted from your camera. But, since the technology has developed a lot, you can recover your deleted NEF images from DSLR camera with the help of Nikon Canon Photo Recovery software. This tool can recover professional RAW photo files. You can check this list to know about the different types of files that can be recovered with the help of this software. Accidentally Deleting: Suppose, you are trying to delete some of your unwanted photos from your DSLR camera. At that time, instead of deleting photos individually, you may have clicked select all option and deleted it. As a result, all the photos from your DSLR camera will be deleted. Forced Ejection of Memory Card: The photos or videos captured by your camera is saved in the memory card. If you want to remove your memory card from your digital camera, there is an option called “Unmount”. This option allows you to remove your memory card safely. Sometimes ejecting your memory card forcefully may result in loss of files from that camera. Capturing Photos while low Battery in Camera: This is a common reason for the files to get deleted from the memory card. Say, you are capturing photos during low battery alert. At the time of capturing an image, your camera may shut down abruptly. In this situation, the captured image may get deleted from your memory card. Faulty Firmware: Firmware is a permanent software program that is in programmed in the camera’s read only memory. It controls, monitors and manipulates the data stored in your camera. If The firmware of your camera gets corrupted, then the data stored in it will be deleted. Nikon Canon Photo Recovery software recovers more than 300 types of different files. RAW photos like CR2, CRW, NEF photos can be recovered efficiently with this software. This tool recovers media files, that were deleted using command prompt. It has a special built-in algorithm to recover deleted photos. Files which are deleted or lost from USB drives, different hard drives like SATA, IDE, etc can be recovered by using this recovery tool. “Save Recovery Session” option is provided on this tool to avoid multiple scanning of drives. This option helps the user to continue the resume process at any time. You can preview your recovered files before saving the file. The recovered deleted files can be sorted according to the name, size, date and file type.